The simple, proven, robust design of the 1030/1040 seal line makes this the foundation of the FSI product offering. 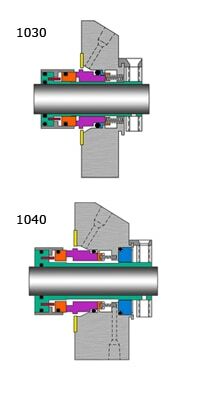 A single cartridge flexible stator design, the 1030/1040 seals are found in applications in nearly all types of industry. Multi-spring stationary design, more capable of handling misalignment between pump housing and shaft. Monolithic face design eliminates the problems associated with press fit/inserted faces. Springs and pins located outside the product to avoid clogging. Hydraulically balanced for cooler and longer running. Clockwise and counter-clockwise tangential ports positioned to allow unobstructed flow directly to seal faces. Springs are securely engaged at both ends retaining spring perpendicularity to face ensuring even face loading. Recessed gasket to eliminate extrusion. Rotating face shrouded in a stainless steel carrier virtually eliminates breakage under excessive conditions. The 1030 incorporates (2) flush ports for either direction of rotation. The 1040, in addition to the flush ports, offers quench ports in and out. The 1040 also comes standard with a carbon restriction bushing. Alternate arrangements include lip seal containment system, labyrinth bronze bushing, or die formed packing system. Elastomers: Fluoroelastomer, Perfluoroelastomer, Aflas, EPR/EPDM as standard o-ring materials. All other commercially available elastomers as specified. Sizes: From 1.00” to 5.00”. Available in both Inch and Metric sizes. As always, consult your FSI representative for applications which approach or exceed these parameters.